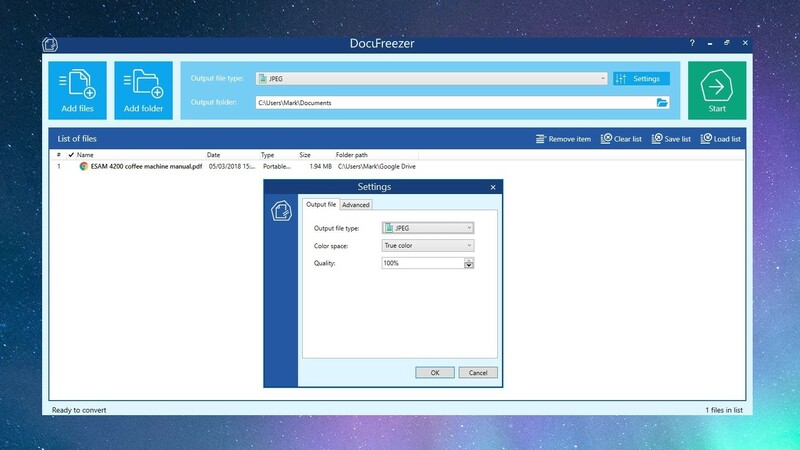 If you need to convert files to image formats – or PDF – DocuFreezer has you covered. Here, we are concerned with its PDF to JPG conversion capabilities, but it can also convert other file types, and you can choose from other output formats including PNG, TIFF and XPS. One of the great things about DocuFreezer is that you can convert singles files, or you can work with a number of files at once – either by adding them one by one to a list, or by adding entire folders to the work queue. You can convert individual files, multiple files from different locations, or files stored in a single folder. There is no support for files other than PDFs, and there are no output formats other than JPEG – the name really does tell you everything you need to know. 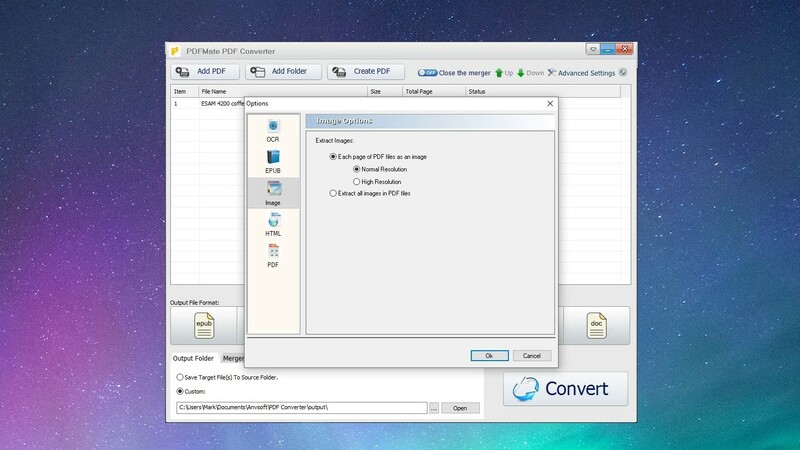 Like other tools we've included here, PDFMate Free PDF Converter can be used to convert a single file, or several at once. It's worth pointing out right from the start that conversion can be a little on the slow side, but it's not so marked as to be a real issue – it's just worth bearing in mind. As an added bonus, the program can convert PDFs to a number of formats, including DOC, EPUB, HTML and TXT – it can also convert files into PDFs – but for the moment it is conversion to JPEG that we're interested in. One for fan of Microsoft Store apps, PDF to JPEG is available for Windows 8.1 and Windows 10. The app is free, but it is ad-supported, so this may sway your decision about whether to use it or not. Like so many Store apps, PDF to JPG has a single function and it approaches it with a minimum of fuss. There are literally no options to configure – unless you count selecting which folder you would like to save images to, that is! Simply load your PDF into the app (you can also select an entire folder full of PDFs if you want) and hit the 'Convert' button. It's as simple as that. The only thing to be aware of is that the 'Convert' button will not become available until you select a target folder – this is something that catches a few people out, as you'll see if you scan through Store reviews. 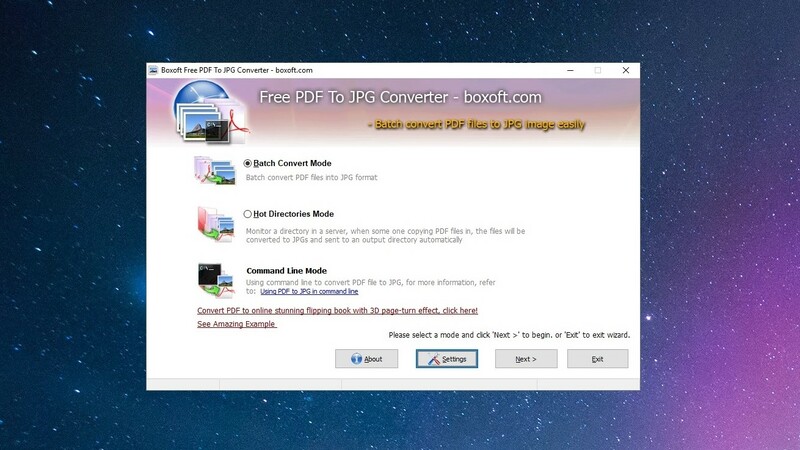 Despite the name, Boxoft PDF To JPG Converter can also convert your PDFs into BMP, PNG and TIFF formats, but the options are the same for each. 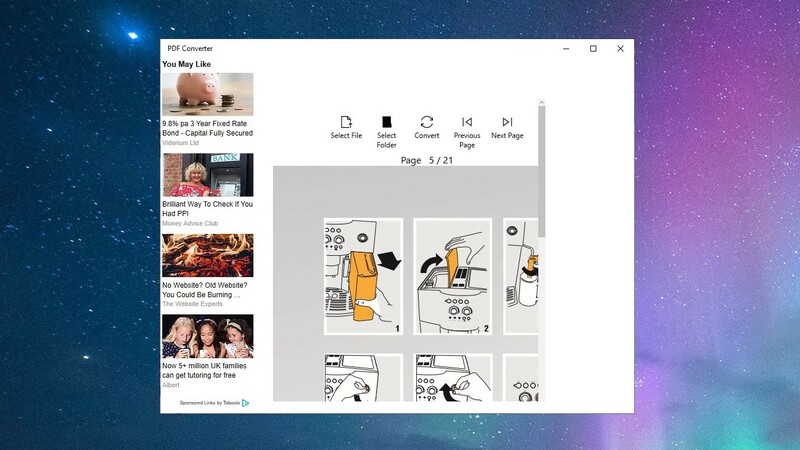 If you only want to convert a few pages of a PDF, this is an option that is available to you, and you can choose an automatic naming system to give your files a consistent look. The focus of the program is really on batch conversion of files, but there's nothing to stop you from using to convert single files – it's pleasing quick in either case.